There is nothing harder than waking up in the morning and getting ourselves dressed. Surely, we can’t be the only ones who have this problem. No matter how many clothes we have hanging in our closet or outfit ideas we plan out, we find ourselves saying we have nothing to wear. Looking for a simple option to make our mornings a bit easier, style-wise? A button-up shirt, of course! It’s the forever fashionable, error-proof way to master morning dressing like a pro. That’s why we don’t just want this shirt, we need it. 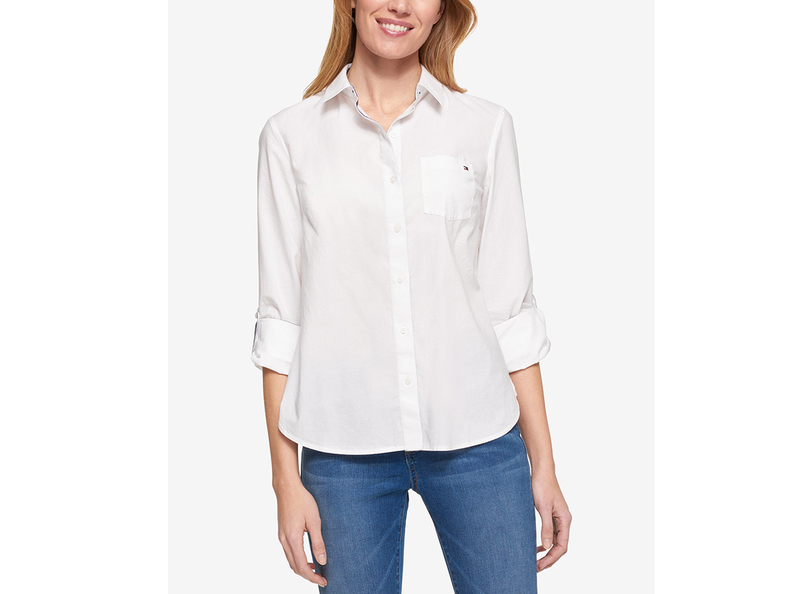 See it: Grab the Tommy Hilfiger Cotton Roll-Tab Shirt (originally $50) now only $35 available at Macy’s! 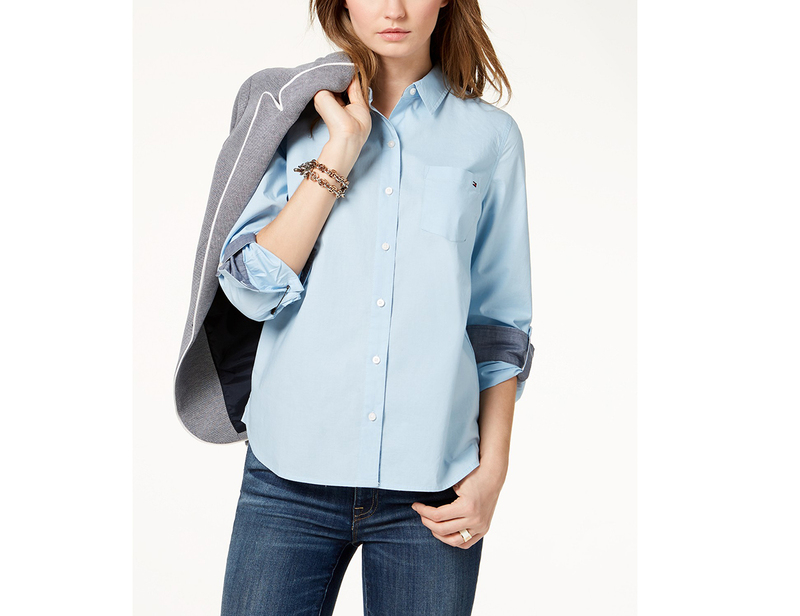 The Tommy Hilfiger Cotton Roll-Tab Shirt is the simplest styling solution ever. It’s the ultimate one-stop shop when looking for a highly transitional piece that doesn’t just withstand the test of time, but the test of seasons. It can be worn 24/7 and year-round while looking just as fresh and fun as ever. Ever notice how waking up five minutes late can somehow completely throw off our entire day? With so little time to spare already, the last thing we want to do is waste time standing around looking at our closet and the endless options. It’s simple. This shirt, obviously. Call it our new favorite must-have! Because this 100% cotton shirt is the shirt we must have. Its pointed collar is paired to perfection with a subtle chest pocket as well as roll-tab cuff sleeves for seasonal wearing. The roll-tab sleeves are by far the most functional detail on this entire shirt and perfect when looking to combat any and all weather. The long sleeves are ideal when looking to stay warm on a chilly morning. It’s also the best option when temperatures begin to rise as the day goes on. Just simply roll the sleeves up and tackle the day. This well-fitting shirt also comes in 10 color options that work for every reason, season or occasion. Across the board, every option is just as sleek and polished as the last. From pinks to yellows and even the always classic white, there is a shade for every shopper. Our favorite? The crystal blue and navy options, which are both the perfect alternative when looking for a more polished upgrade from our beloved denim shirts. Whether this sleek button-up is styled with denim wash bottoms or even satin trousers, the light or dark blue shirt is nothing but sleek in stylish. With so many styling capabilities, it comes as no surprise how well loved this shirt is. This near-perfectly reviewed button-up has hundred of reviewers smitten. From the easy-to-wear silhouette to the timeless design, there is nothing but raving review after raving review. And surely we can’t blame them! This shirt can transition not only through our wardrobes seamlessly but through the season, too! By simply layering a trench coat here or throwing on a parka here, this button-up can work 24/7, throughout the entire year. Honestly, there is nothing better! Mornings may be rough but that doesn’t mean our outfits have to look it. In fact, thanks to this Tommy Hilfiger button-up, our outfits have never looked better. Not your style? Check out additional Tommy Hilfiger options also available at Macy’s!